Kerala has been emerged as a Paradise for honeymooners, because of its beautiful Beaches, Lakes, Backwaters, Hill stations, Houseboats etc.. travelage offers you a world of choices for your romantic honeymoon holidays, romantic vacation or Kerala wedding. We are the only specialist in Honeymoon packages to South India, Kerala and Goa. Arrival at Kochi (Cochin) meet and assistance at the railway station by our representative and transfer to your hotel. Half day sight seeing of Cochin by boat. A few interesting sites included in the tour are the Chinese fishing nets along the Vasco Da Gama Square, Santa Cruz Basilica, St. Francis Church, VOC Gate, Bastion Bungalow etc. Apart from these architectural splendors, an array of restaurants serving fresh seafood is also popular among tourists. The Chinese fishing nets erected on teak wood and bamboo poles work on the principle of balance. Records say they were first set up here between AD 1350 and 1450. Vasco Da Gama Square, the narrow promenade that parallels the beach, is the best place to watch the nets being lowered and pulled out of the sea.Over night stay at hotel. Proceed to Munnar enjoying the scenic beauty & the marvelous waterfalls, high mountains with the low flying clouds passing by.In the evening you can go for sight seeing of Munnar which includes the Raja Malai - a top peak of Munnar where you can see Neel Thar (mountain goats). Other important places are Muttupetty dam and Indo Swiss project (you can also enjoy boating in the Lake) and witness tea gardens spread like a green carpet over hundreds of kilometers.Munnar is situated at the confluence of three mountain streams - Mudrapuzha, Nallathani & Kundala. 1600 meter above sea level this hill station was once the summer resort of the erstwhile British Government in South India. Sprawling Tea plantations, picture book towns, winding lanes, and holiday facilities make this a popular resort town. Among the exotic flora found in the forests and grasslands here is the Neelakurinji. This flower which bathes the hills in the blue every twelve years, will bloom next in 2007 AD. Munnar also has the highest peak in South India - Anamudi, which towers over 2695 m. Anamudi is an ideal spot for trekking.Enjoy boating in the afternoon.Overnight stay at hotel. In the morning depart for Munnar (approx.4 hours journey), enjoying the scenic beauty & the marvelous waterfalls, high mountains with the low flying clouds passing by.Arrive Munnar and check in at hotel.Munnar is situated at the confluence of three mountain streams - Mudrapuzha, Nallathani & Kundala. 1600 meter above sea level this hill station was once the summer resort of the erstwhile BritishGovernment in South India. Sprawling Tea plantations, picture book towns, winding lanes, and holiday facilities make this a popular resort town. Among the exotic flora found in the forests and grasslands here is the Neelakurinji. This flower which bathes the hills in the blue every twelve years, will bloom next in 2007 AD. Munnar also has the highest peak in South India - Anamudi, which towers over 2695 m. Anamudi is an ideal spot for trekking.Overnight at Munnar. Morning, proceed to Periyar on the way visiting Idukki dam.On arrival check in at hotel. 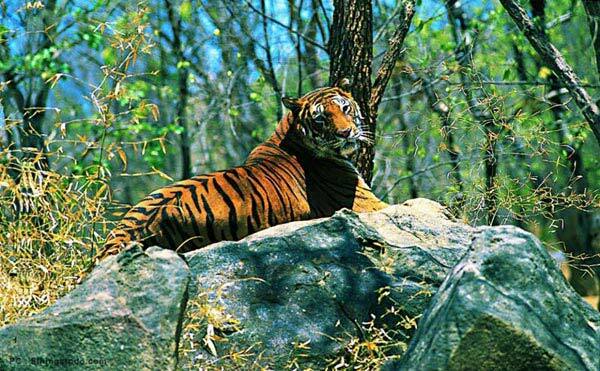 Periyar wildlife sanctuary is home to nomadic tribes of wild elephant, boar, deer, the great Indian tiger and more. Evening go for boat cruise in the lake to watch wild animals. Overnight stay at Periyar. Morning, after breakfast boating through Periyar lake - Wildlife sanctuary. You can visit the rare species of plants and animals.Afternoon visit spice plantations like cardamom, cinnamon, pepper, coffee, tea estates etc. on your way back to the hotel, you could stop at the local market and pick upsome fragrant spices. Overnight stay at Periyar. Early morning proceed to Kumarakom. Reach and visit the Bird Sanctuary. Proceed to the Vembanand Lake.The backwaters of Kerala are a unique product of Kerala and are found nowhere else in the world. Backwaters are a network of lakes, canals and estuaries and deltas of forty-four rivers that drain into the Arabian Sea. 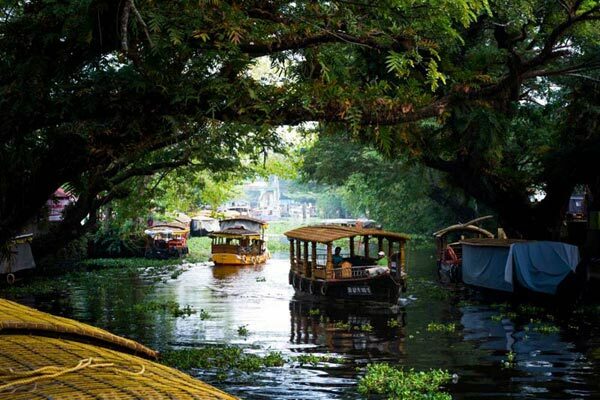 The backwaters of Kerala are a self supporting Eco-system teeming with aquatic life. The canals connect the villages together and are still used for local transport. 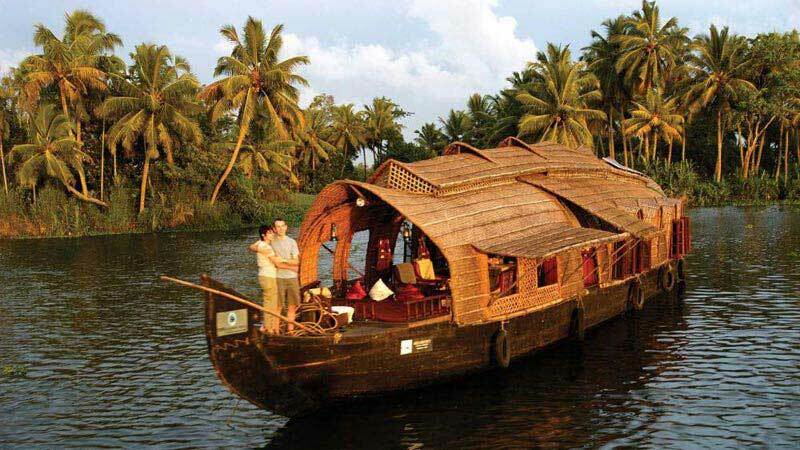 Over 900 km of this labyrinthine water world is navigable.Check into a traditional houseboat of Kerala Style and go on a leisurely backwater cruise along the lake on a thatched houseboat.The houseboat with all modern comforts lets you discover the countryside at your own pace. You will have lunch, dinner and breakfast in the Houseboat. A ride on the houseboat is a fabulous way toexplore the fascinating beauty of the backwaters.Cruise through thebackwaters to Alleppy. Overnight at Houseboat. Disembark the boat at the reception of the backwater resort at Alleppey.Alappuzha is famous for its boat races, houseboats, coir products, fish and lakes. 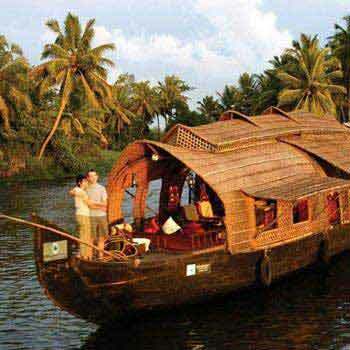 Alappuzha remains prominent on the tourist trial of Kerala as one of the major centres for backwater boat trips. "Kuttanad" in Alappuzha is one of few places in the world where farming is done below sea level. Kuttanad is a land of lush paddy fields and is called the 'Rice Bowl' of Kerala. Kuttanad stretches for 75 Km sandwiched between the sea and the hills.Check in at the resort. This resort is one of the finest one in Alleppey Here you can enjoy the lively villages and backwaters. Overnight at Alleppy. Destinations Covered : Kumarakom, Kochi, Kovalam, Thiruvanantha.. Destinations Covered : Kochi, Kovalam, Kottayam, Alleppey, Triv..